Select a printed advertisement from the internet, newspaper or magazine and answer the questions. Ads provide a terrific opportunity to develop critical thinking skills. Ads don't have a great deal of content and students will have to read between the lines which leads to making some predictions and inferences which are the higher level thinking skills. Critical literacy can often be achieved through media literacy. 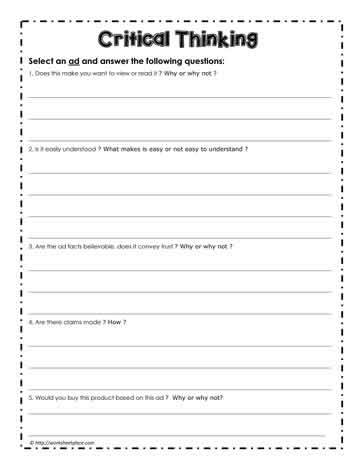 This worksheet asks students to think critically about the ads they see and read.